The Classics season is all over us. Milan-San Remo took place last weekend, and now the hardest week of the entire season is due. Some 500km over treacherous cobbles in two days. I bet the riders are happy there is a mere week between the two, giving them just enough time to recover. The Ronde van Vlaanderen or Vlaanderens mooiste (Flanders finest) and the Queen of the classics herself; the Paris-Roubaix are without doubt my favourite week of cycling, two of the very Monuments of cycling. How do the different teams prepare? If you're doing one of the sportives right before one the two races, you might have asked yourself the same question. The recipe for success in the race as well as in the sportives is in the preparations. You might not do exactly like the pro teams but some similarities are there still. Few have the financial means to do so, fewer have the insight. Jonathan was helpful to hook me up with Igor Turk (IT), one of the mechanics on duty during the cobbled classics this spring. PTR: Hi Igor, what is your background and how did you end up in Team Sky? IT: I started my cycling at age 11 as a junior rider and continued to ride up until 1995 (age26) when I become mechanic in the team where I was racing from the begining (Krka-Telekom/SVN team). The team asked me if I was interested in being a mechanic and because I was not a real good rider, I accepted. I needed to learn a lot and was also working alone as I was the only mechanic for all kinds of riders on that team. In 2001 I went to the team Gerolsteiner where I was until the end of the team in 2008. While I was there with the team, it went from small team to a UCI ProTour Team. Again I learned many different things, especially in the first year. PTR: What differ Team Sky form other teams you have worked with? IT: In 2009 I was then in team Milram before joining Sky in 2010. It was different straight away - the first meeting wasn't about days of work and money but the questions were on a different level, like how we if we work together in the team we make it better. If we become the best support team for riders, so they will perform better. In the team it's always communicated to us that the important thing is to do your very best. Team Sky have also the first truck made with side pods which go out so mechanics and carers can work inside (if raining or hot weather), with AC and TV. PTR: Guess that comes handy during warm days in summer. 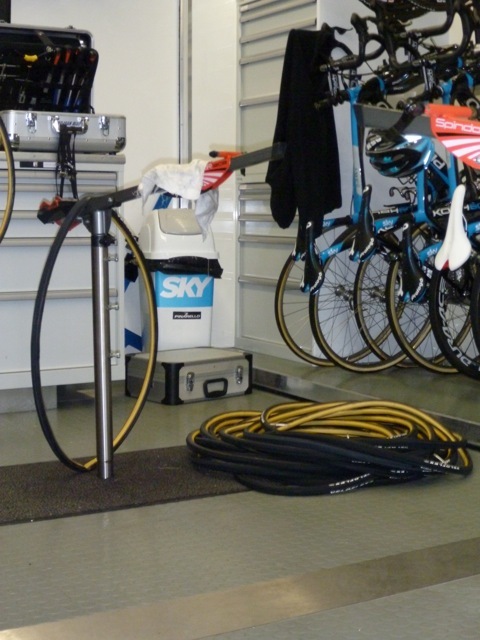 The cobbled classics are over us, how do you set up the bikes, special frames, handlebar tape and tires? IT: For cobbled races we have special frames, and also set up. First, in the handlebar we put near to the stem one more small brake end also buttons for shifting (riders grab handlebar in cobbles up, so they can brake and shift). We put double tape or some gel under the tape (depends what the riders prefer). Some of the riders change seat for a more soft one. Wheels we take classic (alu,no carbon) with 25-27 tires which have less pressure(normaly 9bar, here 7bar). Chainrings depends on the individual rider and how they ride on the cobbles (in which rpm). PTR: Braking and shifting like a XC rider, how about that? Guess that is not for everyone.. How about damage to the bike? IT:In cobbled races the damage is mostly flat tires, broken wheels (mostly the carbon ones), there are also lot more crashes (especially if is raining) so you can sometimes get a broken frame. PTR: How are the mechanics team organised during a cobbled race and do you have mechanics whose special field is different from others? IT: In the cobbled races we are mostly working the same way as in other races. However they are differences in that some of the mechanics or other members of team go with some spare wheels at various points agreed beforehand with the DS. It helps if our riders have a flat and the car with the race mechanic isn't right behind - or if the rider in question is behind the team car. In the team all mechanics can cover all parts of the work, the only specialist field is in making wheels, some of mechanics are better at making wheels as to make a good wheel takes some experience for cobbled races. PTR: Back in the day teams like US Postal used to store the tires in a basement in France or Holland for years, to give the tires the proper moist and elasticity in hope to avoid flats. Do you do something similar with yours? IT: In Gerolsteiner we also had something like this in our basement, for the big and important races, older tires they are much better and in some big Tours we didn’t have any flats. Last year we were testing some more different brands. Now we've decided on Veloflex tires, we'll put some into store so that they get older and better. Last year's collection of tires ready to be glued before Paris-Roubaix 2010. 100 tires were prepared. Photo downloaded at www.michaelbarry.ca, here. PTR: How will you describe the relationship between the mechanics and the representatives from the "mechanical" brands like Shimano et al? How do you keep track on R&D? IT: I've worked with a few different brands: Campagnolo (Krka-Telekom), Shimano (Gerolsteiner), SRAM (Milram). The longest time i spent with Shimano and I must say that they are the best to work with. They listen and try to make everything better, like sending engineers to races...we have realy good relationship with Shimano. For staying on "top”of all new things in the bike industry it's mostly the internet, bike magazines, talking with other mechanics and presentations from Shimano. PTR: Well, thanks for taking the time Igor Turk, really appreciate it. Good luck in the cobbled classics.